The HCB crushing bucket is the latest evolution of crusher bucket design and technology. 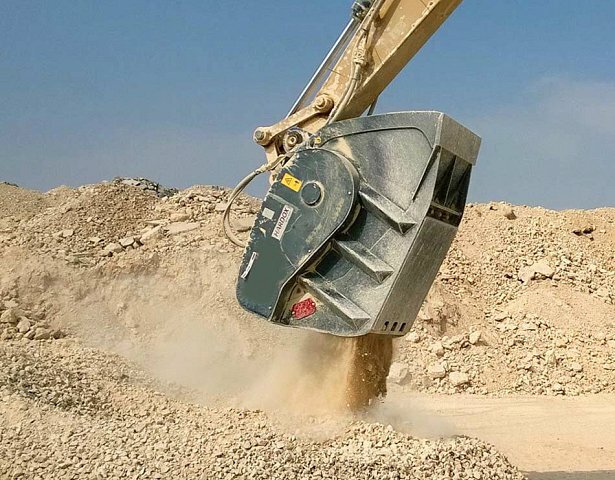 The crusher bucket rear jaw plates are adjustable to offer material sizing from 20-120mm depending upon your material requirements, this will give production rates of around 20-25 tonnes per hour on a typical 20 tonne excavator. The HCB buckets are powered by the excavator breaker-circuit so no extra services are necessary saving expense and allowing for ease of use within your machinery fleet. 5 Models are available to suit excavators from 12 to 55 tonnes.